The step-by-step process of how a comic book gets made might be a pretty common bonus feature in paperbacks these days, but back in 1996, the process was a little more mysterious. That's why the Canadian TV show The Anti Gravity Room -- which aired in America on the Sci-Fi Channel -- did an episode where they took their viewers through the whole deal, from plot all the way to publishing. And the guys they chose to walk you through it? 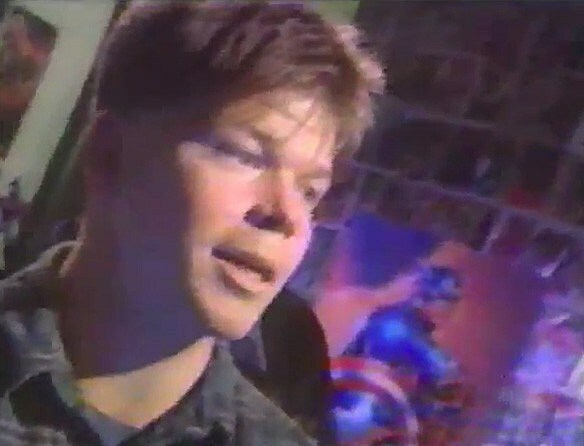 Award-winning cartoonist Ty Templeton and the man who needs no introduction, Rob Liefeld. Check out the video, ripped from glorious mid-90s VHS, below! I'll admit that it's always pretty fun to watch the Rob be interviewed, mostly because he always comes off so darn friendly. It's also worth noting that this this interview took place fifteen years ago, but he looks the exact same as he does today. The man does not age. I am convinced that he has a portrait of himself in his attic -- complete with bulging muscles, shoulder pads, thigh pouches and tiny feet -- that's slowly growing more and more withered, while the Rob himself remains eternally youthful. One of the best bits comes when the Rob talks about where he gets his ideas, and he mentions thinking up comics while sitting in church. When I sent this video to CA's Editor-in-Chief Laura Hudson, she asked me which of Rob Liefeld's comics I thought were the ones he thought up in church. I think that's pretty obvious; it's probably the one where Jesus pulls Himself off the cross and has a fistfight with Zeus. I remember watching this when I was a kid, and somehow I completely forgot about the part where the host, Phil, gives Rob Liefeld a plot about how he wants to make out with Avengelyne, Glory, and the girls from Gen 13. 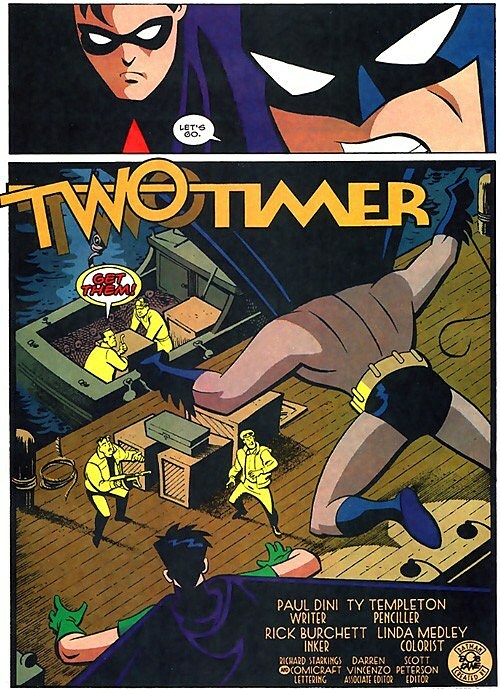 What I do remember, however, is the art process bit with Ty Templeton. And considering it opens with him just straight up throwing away what everyone else wants to talk about so that he can do something that involves Batman, it probably had a pretty profound impact. Templeton's great, and he does his section with a ton of humor that makes it really fun to watch. What makes it really interesting is that he's showing how to do everything by hand -- he mentions that coloring the actual pages is on its way out due to computers, but even lettering the pages by hand before the art is completed is something that's rarely done anymore. The show continued with a segment about editors with legendary Marvel EIC Jim Shooter and even a trip to the presses to see how comics were actually printed, and it makes for a pretty neat, surprisingly informative show. It's well worth taking the half hour to check the whole thing out -- if only because you get to see the Rob interviewed in front of his infamous Captain America drawing. Unfortunately, it never comes up in the interview.